After a wild and unimaginable weekend of World Cup upsets, betting legally sportsbook players are wondering what’s next. Well, after the Round of 16 wraps up this Tuesday, the best USA sportsbooks will be looking ahead to the quarterfinal round of action. The level of play has increased significantly in the Round of 16 and sportsbook bettors can anticipate a similar phenomenon moving forward. So, let’s take a look at this Saturday’s Uruguay vs. France pairing, which is shaping up to be one of the best we’ve seen in the tournament yet. Uruguay team opened up their World Cup play by delivering a solid 1-0 triumph over Egypt. No doubt the Uruguayans were hoping for a more dominant performance to open up their World Cup play. However, the Egyptians have tremendous defense and Uruguay was happy to get the win. Afterwards, the South Americans faced the Kingdome of Saudi Arabia. Although Saudi Arabia isn’t as stout as Egypt is defensively, they were still able to deter some of Uruguay’s offense. But in the end, Uruguay came out on top 1-0. The final group stage matchup saw Uruguay take on the host country. This time around, Uruguay delivered the brilliant offense they’re known for and come out on top 3-0. After such a great start, Uruguay was rewarded by being paired against Portugal in the round of 16. Although they posed a great challenge, Uruguay survived 2-1. They now look to do the same against France. The soccer team of France is filled with talent so it’s no surprise to see them making it this far. Like the team of Uruguay, France has yet to taste defeat at this year’s World Cup. Granted, they have drawn a couple of matches. The Frenchmen opened up World Cup play by delivering a 2-1 beating of Australia. Afterwards we saw them get the job done 1-0 against Peru. Then came the Frenchmen’s 1st draw of the tournament, 0-0 against Denmark. Notwithstanding that draw, France had done enough to get them out of the group stage. Unfortunately for them, they were tasked with facing Argentina in the round 16. In the end Messi didn’t prove to be unbeatable as France eliminated Argentina 4-3. This weekend, France is hoping a banged up Edinson Cavani misses the match so their side gets an upper hand. The above listed odds hail from MyBookie.ag, one of the best sportsbooks to turn to when betting on the quarterfinals. MyBookie.ag has everything you need to get you started like an easy to use interface and great sign up bonuses that’ll get more money in your pockets. Feel free to check out our online betting review on MyBookie.ag to get a closer look at what they offer. 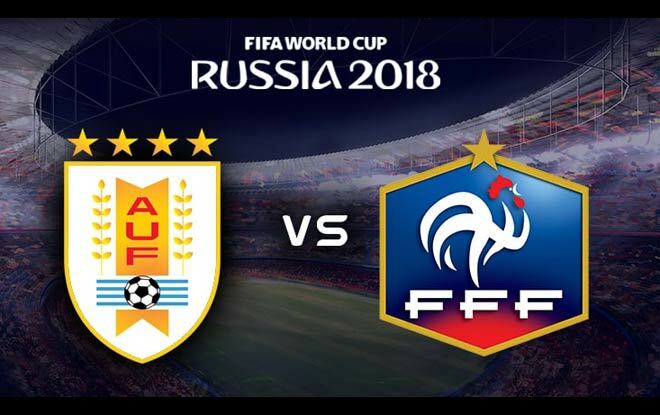 You can also hop to their site to make your France vs. Uruguay prediction today! Best Online Sportsbook Prediction: 2-0 Uruguay. Best Online Sportsbook Bet to Make: Take Uruguay straight up.